In the previous 2017 roundups, we saw how small Bollywood films threw pleasant surprise as they were high on content and successful at Box Office as well. There is a list of Bollywood films in 2017 which were just incredible and treat to watch. Now in this part of the roundup, we’ll discuss those films which proved to be most profitable for their makers. The list has been charted keeping in mind the budget, business and profits. The films with highest Profit or ROI (Return on Investment %) have been kept higher. And here’s how we’ve calculated the ROI & ROI%. There’ve been some wonderful surprises after compiling the list as the small films have again proved to be winners. Films like Lipstick Under My Burkha, Hindi Medium and Newton have shown excellent ROI. However, it’s not like Big films were really bad. There are several big films in the list which have generated huge ROI despite being set on great budgets. 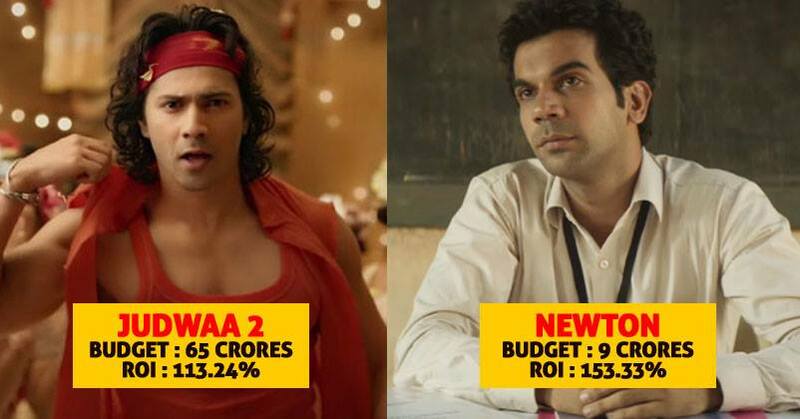 Judwaa 2 which was panned by critics has proved to be a huge profit maker. The film’s profit value is more than the budget value which proves that it was well accepted by audience. Another film of Varun Dhawan, Badrinath Ki Dulhania has managed to be in the list. This also goes on to prove that nepotism is not that bad and Karan Johar is right in casting Varun & Alia in most of his films. Akshay Kumar’s Toilet Ek Prem Katha has also proved to be very profitable venture for it’s makers.